If you want to truly understand the psyche of the inhabitants of Maramures, a visit to the Merry Cemetery in Sapanta, nearby the city of Sighetu Marmatiei, is a must do. 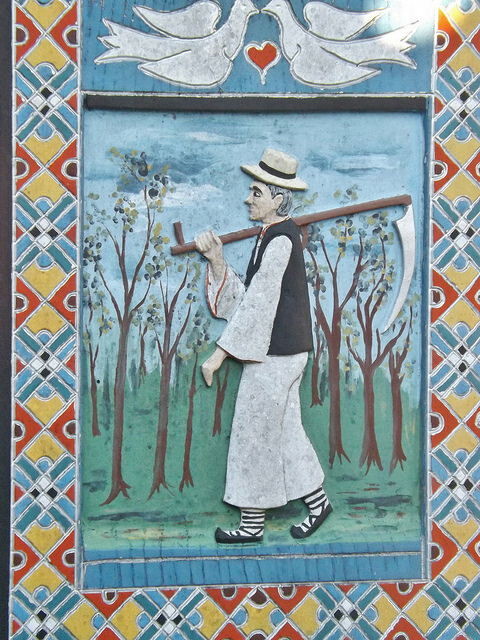 The brightly painted (many in sky blue) crosses and tombstones of the cemetery usually depict a significant scene from the life of the person buried in the grave, along with a few verses, that are often humorous and tongue-in-cheek. Cimitirul Vesel or The Merry Cemetery is a quaint tourist destination, embedded with an unusual form of beauty. It gathers over 800 tombstones and crosses portraying amusing scenarios and aspects of life, such as family problems, alcohol issues, infidelity etc. 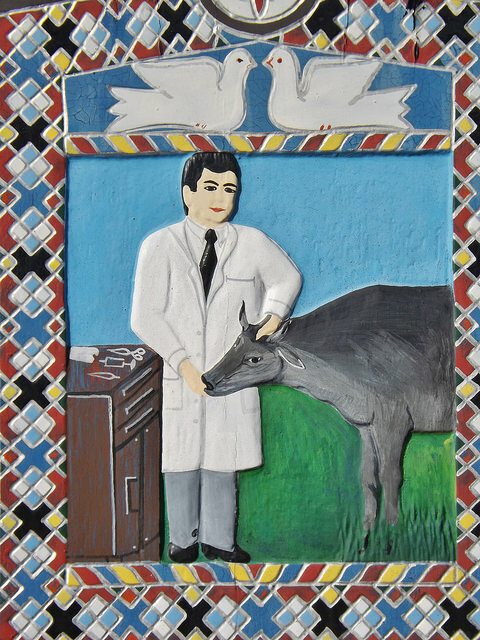 The first paintings (representatives of the naive art) and carvings were originally done by Master Ioan Patras Stan, who sculpted the first verse on a tombstone around 1935, having continued his work until his death in 1977. The messages and epitaphs were descriptions of the persons buried within the cemetery and they sought to amuse the passer-by. 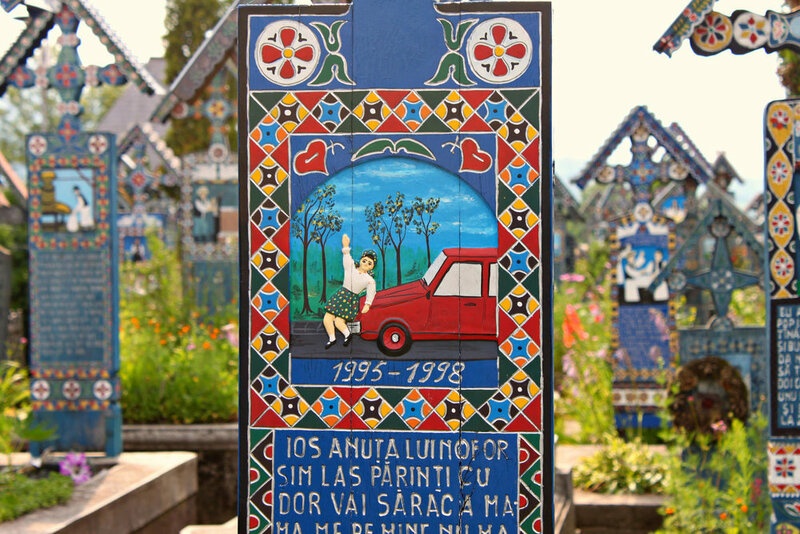 Located in the village of Sapanta, in the historic region of Maramures, northern Transylvania, the cemetery is full of blue oak slabs nicely decorated with flowers and portraying humorous situations, therefore making the statement that death is no reason to mourn. Famed for its comical approach towards the macabre subject of death and the Underworld, The Merry Cemetery of Sapanta is a place unexpectedly filled with joy, where smiles and laughter are almost guaranteed. It is not a quiet, solemn, depressing place meant for mourning the dead. It is the exact opposite. It is a place meant to cheer with the dead and embrace the notion of immortality. The Merry Cemetery of Sapanta is one of Romania's most popular destinations. Here, death is considered a reason of celebration, laughter and joy. The cemetery is an art museum and the beliefs it portrays are closely intertwined with the local Dacian culture, whose beliefs were in accordance with Zalmoxianism (the moment of death should be filled with happiness). The creator of the Cemetery is Master Stan Ioan Patras (1908-1977). A stroll through the cemetery is the ideal thing to do, as it will definitely lift up your spirits and offer you relief from any worries or burdens that might distress you. Have a look at the many tombstones and admire the artwork (if you aren't familiarised with Romanian language) which often speaks more to the passer-by than the words themselves. Nevertheless, the epitaphs are a great amusement (having to read about the indignation, hostility, ideals, etc. of others) all written in a characteristic way meant to provoke laughter.